You are here: Home / Product Reviews / Babies & Kids / Strider No-Pedal Balance Bikes: Teaching Children Balance While Having Fun and Getting Active! 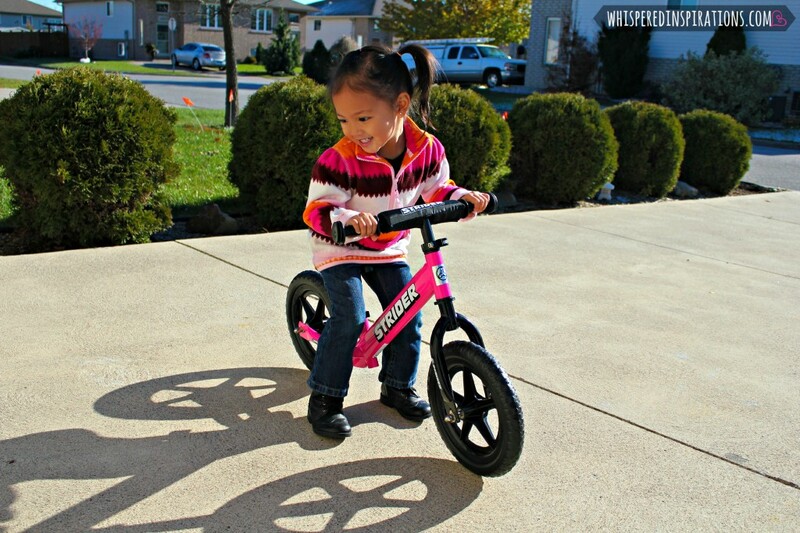 Strider No-Pedal Balance Bikes: Teaching Children Balance While Having Fun and Getting Active! Mimi is at an age where she’s still too little to ride a bike and still has a bit of trouble trying out the pedals on a bike with training wheels. 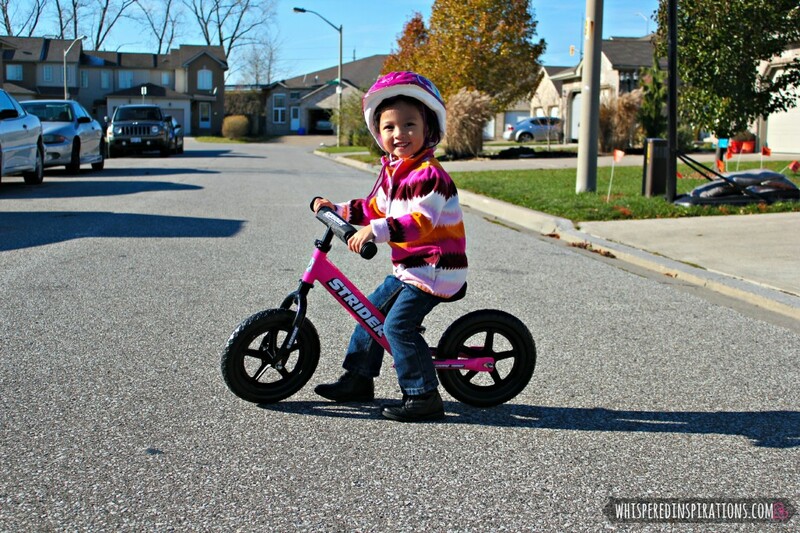 When we had the opportunity to try out the Strider bike, we were stoked and Mimi of course–was over the moon! If you aren’t familiar with no-pedal balance bikes, they’re pretty cool. 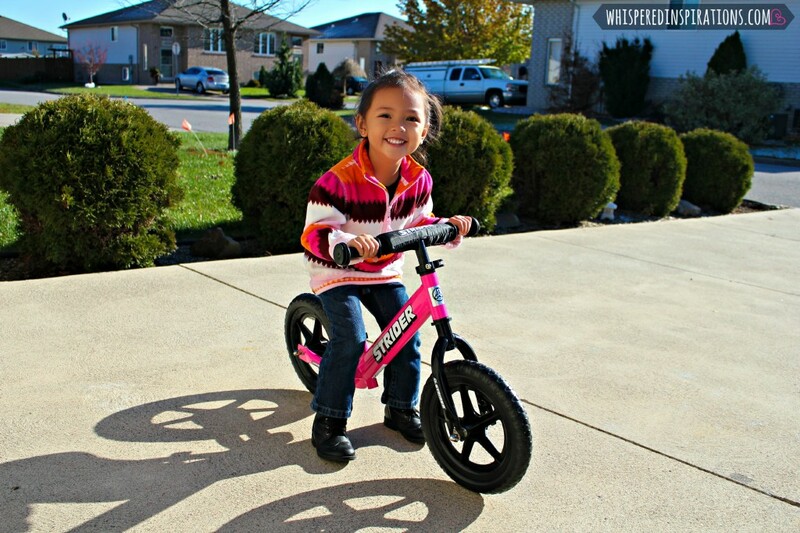 The STRIDER™ Balance Bike teaches children balance and coordination in a secure learning situation. The bike’s low seating allows children to place both feet firmly on the ground, providing them confidence and control. 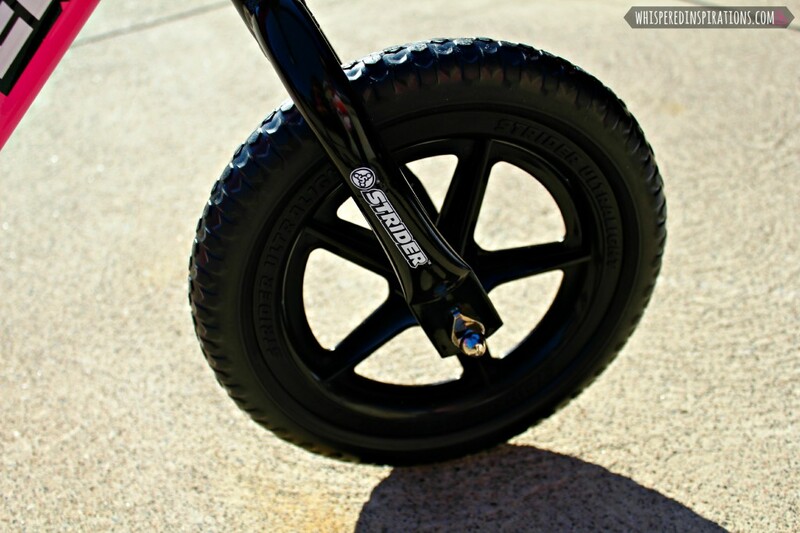 The STRIDER™’ light weight adds to this feeling of control. Because kids feel secure, their natural curiosity kicks in and they quickly learn to steer and to balance. They are not afraid, but enthusiastic and eager to try new skills and to push themselves. One of the great things about Strider is that the bike is very lightweight. It weighs less than 7 pounds and it comes in a box, semi-assembled. It was super easy assembling the bike and in about 10 minutes, her new bike was ready for some action. You can get this baby for $124.99 which, to me, is pretty affordable since they can get years of use and fun out of it! The bike has a quick-lever on both the seat and handlebars so that you can adjust the bike perfectly to your child. The bike frame is sturdy and good quality. By that, I mean it looks like a strong mountain bike, even though it’s super tiny. Not to mention, the bike comes in a gorgeous pink and Mimi loved that. The Launchpad footrest is pretty cool and when your child gets comfortable they can rest their feet on it and glide! The EVA polymer tires are ready for the road and never have to inflated and they’re puncture proof. After a few weeks of riding this baby, I can see Mimi going out for some awesome fun! It can be ridden in the yard, on the bike path, in the woods, virtually anywhere you walk. One of my favorite things about this no-pedal balance bike is the fact that it has a very low seat. Which is easy-adjustable and since Mimi is a teeny one, this worked perfectly. Now, when my mother saw this bike she freaked out because it doesn’t have pedals or even a hand brake. But, Strider researched various “stopping” methods as they relate to young children. In the end, in a panic situation, the natural instinct of children is to put their feet down. Even children capable of using a brake revert to planting their feet if they have to stop quickly. I guess this would be the only downside to the design of this bike for some people but, Strider offers an optional hand brake option for those who feel need it. After seeing these little speedsters in action, I’m even more sold! I love how you can start off at 18 months and up until they are 5 years-old and that they come in 6 different colors. So, there’s one for everyone’s taste! It’s super cool that you can customize the bikes too, from handle bars, colored wheels and even snow skis for winter fun! Michaela took to the Strider bike with no problem, the seat allowed her to sit comfortably and get a feel for it. The handle bars have a good grip so she was able to navigate perfectly. Soon enough, she was on the street and on the move. Since it’s so close to Christmas, she asked if Santa had dropped it off and she was super excited and convinced he had. We played along and said, yes, she could test it out first. Luckily, we still have decent weather and we were able to test out the Strider quite a few times. Come Spring, I think Mimi will be a little Evel Knievel. So far, it’s a hit and I don’t see that changing anytime soon. Not to mention, she’ll love to be side by side with her sister who rides a bike in no time. If Your Child Can Walk… Your Child Can Ride! If you want more information about getting your child their own Strider bike, head on over to Strider’s Facebook page, here. You can also get the latest updates about events and cool pictures of kiddos enjoying their bikes! 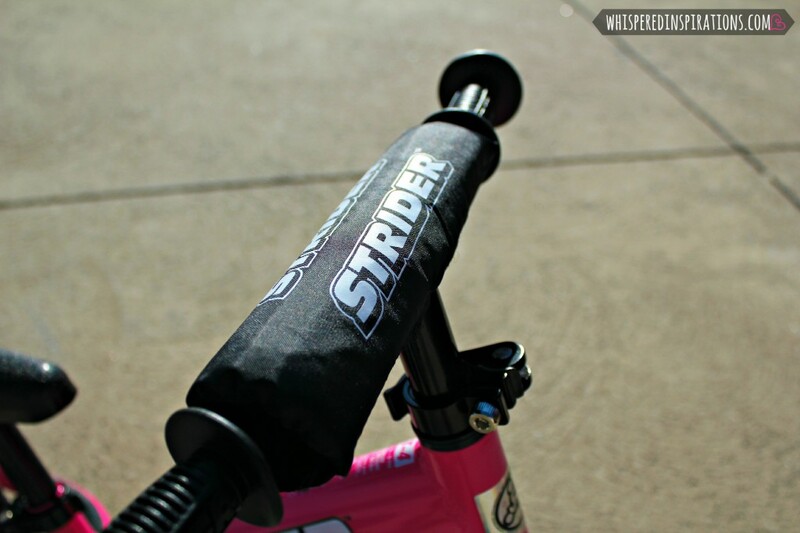 Whispered Inspirations readers can get FREE SHIPPING on their new Strider bike purchases up until in Christmas! Just use the PROMO CODE, ‘WhisperedStrider’ at check-out and let Strider take care of the shipping! Have you ever tried a No-Pedal Balance Bike? I've heard so many good things about balance bikes! I'm thinking of getting one for my 3 year old for Christmas. I'm sure he'd love it and be ready to ride a real bike in no time. My recent post Are You Missing Out Financially When It Comes To Insurance? That video is adorable. You can see how determined those little striders are! Omgosh the video just made me giggle! So flipping cute I could cry! This is an awesome post! I love the idea of these…we have one for our 5 and 7 year old. It's a little small, but I wish we would have started with one right away….they still want their training wheels. I really want to get my 2-year old son a balance bike. I think we will get him one of those before we get him a traditional bike. Great idea! I didn't know about these when my kids were learning – we struggled the hard way! I've seen a lot of kids lately with this kind of bike. 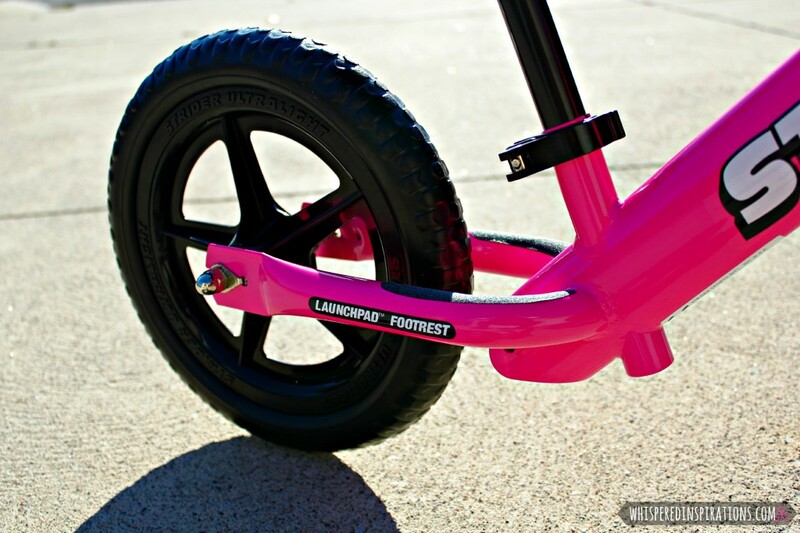 Such a great idea and perfect for teaching kids the most important element of riding – balance. I would love to try these with my boys. I think they would love them! Those are so popular now! Chelsea is kind of mastering the real deal, but this would have been a better way for her to start out. What great pictures! And that video is way cool!! So adorable! Beautiful pictures and videos! These is a neat product! Your little one is so adorable. 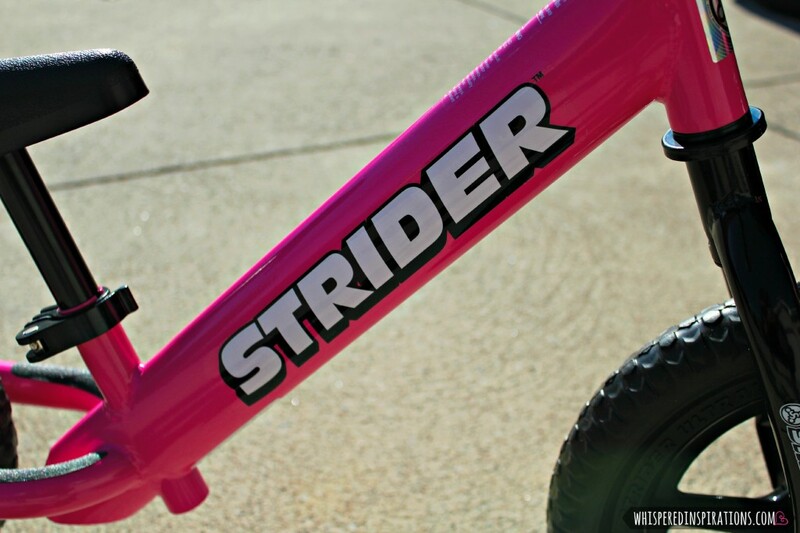 Strider looks like a great started bike for wee ones. It is quite snazy looking as well. What a cutie! My little guys are at the perfect age for the Srider bike. I am going to look into them for next spring! It is great that kids can start learning balancing at a young age. It is good for their posture, confidence and general strengthening, just like adults who exercise, would be benefited by balance exercises. I still remember back in the good ol days when I first learned to ride a bike – your parents had to let go and let you go off, knowing you'd probably fall how many times. This is better than "training wheels"!! That Little Girl is so cute and Also I love here his bike.